To wrap up today, here's yet another example of just how weird professional athletes are, from a few days ago: They sometimes live in a batting cage. That's what the Angels' Reggie Willits does, anyway. Reggie and Amber never planned to live in a cage. 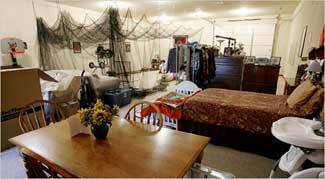 In 2003, they decided to build a 3,000-square-foot house on five acres they own next to his family in Fort Cobb, Okla. The batting cage happened to be the first part of the house that they built. But when the cage was finished, Reggie and Amber saw a way to save money from his minor league salary. They did not have to complete the house. They could simply stay in the cage. From the outside, it looks like a warehouse, 60 feet long and 32 feet wide. But inside, it has everything a baseball family would ever need: a place to eat, sleep and hit. Our favorite part? A quote from Angels hitting coach Mickey Hatcher, about Willets' wife: ""I know she's taken a few in the helmet. But that's part of the game." Hey, maybe Brett Myers should move his family there.